The cakes should bake seven minutes exactly, at least in my oven. I needed about two tablespoons extra butter (to total two cups) in order for my buttercream to set up. It helps to switch to the paddle attachment when you add the butter to the buttercream. The cake is meant to be decorated with the word "opéra" and a piece of edible gold leaf, but alas, my pantry wants for gold leaf. 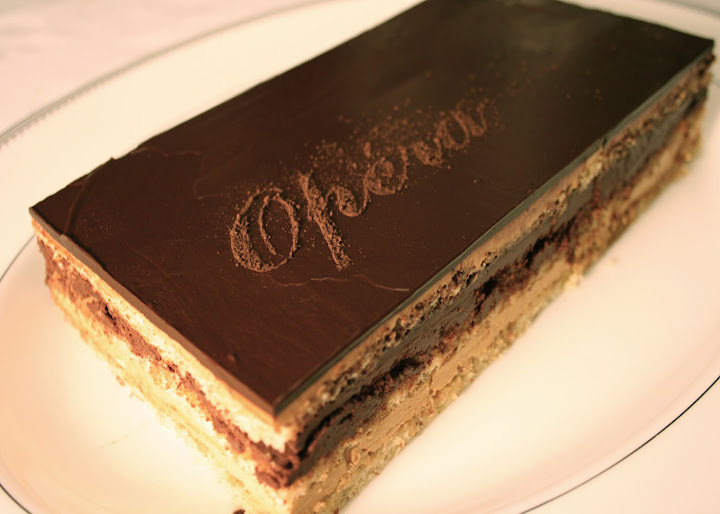 To make the "opéra,"print out the word in whatever font you like (mine was sized 130 pt for a five by ten-inch cake), and cut out the letters, making sure to leave paper connecting the "holes" in the o, p, e, and a. Place your stencil over your cake, and sift dutch-process cocoa powder or confectioner's sugar over it. Try the recipe - it seems daunting, but it's really just a series of basic to moderately difficult baking tasks. And the cake is delicious. how many layers of cake is it? and is that square in the second picture 5x5"? I was reading the recipe and it seems unclear. Also, how do you get the edges so clean? It’s three layers of cake. You cut each sheet cake to make a 10”x10” square and a 5”x10” rectangle. Cover one square with buttercream, then lay the two cake rectangles on it to make another square, cover it with ganache, and lay the second square on top, and cover it with buttercream and glaze. Once the cake is glazed, trim the edges with a long knife to get it perfectly smooth. Then I cut the square in half to make two 5”x10” rectangles (pictures 1 and 3), and froze the other half.